Support for the Seeeduino Arch Pro board. 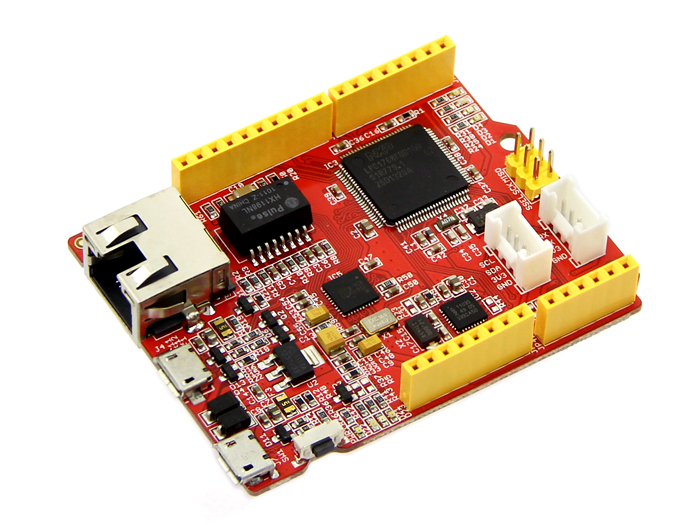 The Seeeduino Arch Pro is an 32-bit ARM Cortex M3 microprocessor development board, featuring an Arduino-compatible shield interface and a RJ-45 network interface. The first UART device is mapped to stdout. Note: the board controller always configures the virtual serial port at 115200 baud with 8 bits, no parity and one stop bit. This also means that it expects data from the MCU with the same settings. Note: to use the virtual serial port, ensure you have the latest board controller firmware installed. To flash, the OpenOCD Software is required. LPC ARM Cortext MCUs need a flash image checksum. When running make flash, this checksum is automatically generated and inserted into the firmware image right before flashing. It depends on the lpc_checksum command-line utility, which can be installed using using pip install lpc_checksum or pip3 install lpc_checksum. After installing this utility, it should be available on your command-line. For using the Seeeduino Arch Pro development kit we strongly recommend the usage of the GNU Tools for ARM Embedded Processors toolchain. Image: taken from Seeeduino website. Board specific definitions for the Seeduino Arch Pro board. Peripheral MCU configuration for the Seeeduino Archo Pro board.